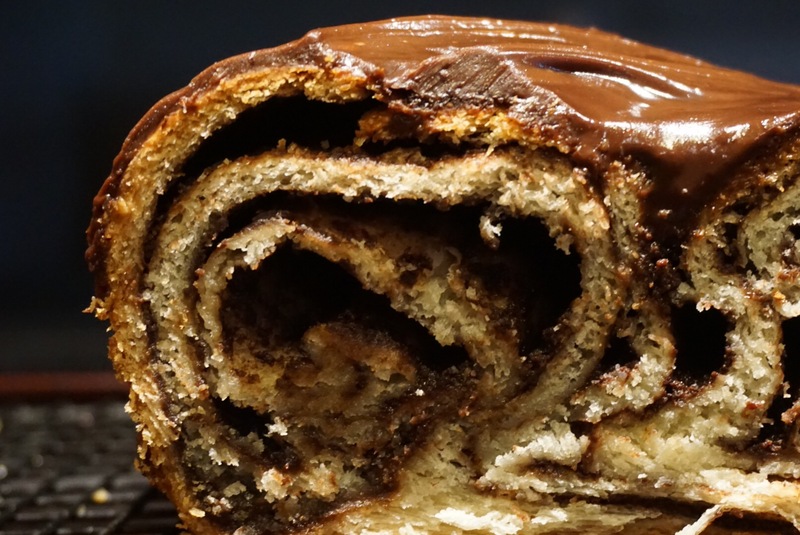 If you read Food and Wine, or look at the cover in line at thegrocery store, this chocolate babka will look familiar. Or maybe it will look a little flatter than it should be. Regardless – find the recipe here. I suggest buying the magazine though because their website is a pain. I veered from the recipe in two places – where it said “let it rise for two hours until doubled in size” I instead let it rise for the amount of time it takes to put kids to bed and watch an episode of The Making of Murderer. That is about 90 minutes, and in that time it rose somewhere between “not at all” and 10%. But it was 10 pm and I wantedto bake it before I went to bed so into the oven it went. Hence the slightly rectangular shape instead of the beautiful squares you see on Food and Wine. I did the glaze in the morning and this is where I made another change. I was out of butter after the almost 3 sticks used in the dough and filling. (I accidentally ate just a salad for lunch a few weeks ago and I have been in a baking frenzy ever since.) So I thought, “ugh! Another stick and a half of butter and 12 ounces of chocolate!” So I used four ounces of cream and four ounces of chocolate (or maybe 6 and 6) for a ganache. I went to bed thinking the loaves were pretty enough without the glaze but in the morning I could see the glaze was necessary. As I was waiting for kids to get up, I did a little research into the history of chocolate babka, because 100 % of my knowledge was from The Seinfeld episode where the bakery runs out of chocolate babka and Jerry and Elanie are forced to get a lesser babka: cinnamon. So I rewatched the clip and then looked up choclate babka on wikipedia (I didn’t say my research was very thorough or extension) and I learned it is an Eastern European (I kinda got that from the name) holiday celebration cake. So where did I get that it was appropriate for breakfast on a Friday? Fancy Breakfast Friday has officially gone off the rails. 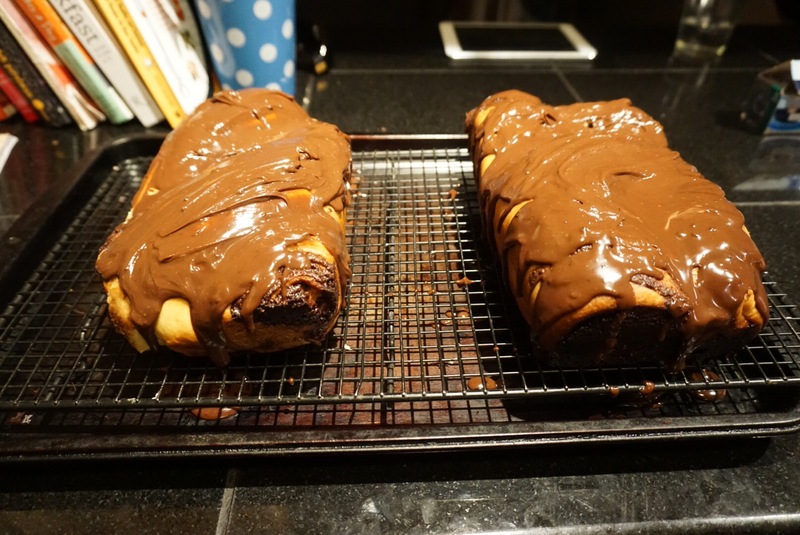 Lucky for me, we had plans to stay with friends at their condo in the mountains, and you make yourself welcome with a chocolate babka. (I threw in quiche for good measure.) The babka was a hit, with Jack requesting it for his birthday, which as we know is the highest praise that can be given. 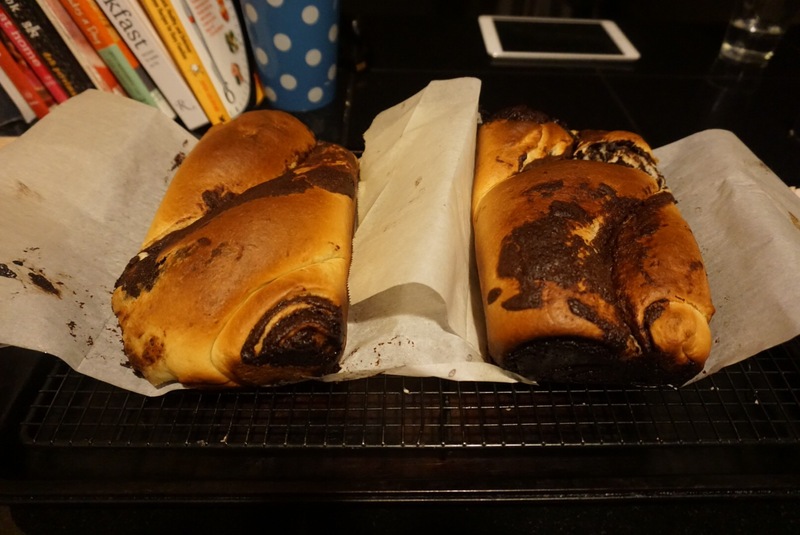 This entry was posted in food and tagged babka, breakfast, chocolate on January 29, 2016 by metamegan.